I will introduce Japanese crafts designated as National Treasure. 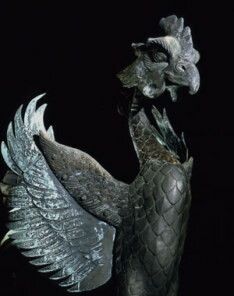 Japanese crafts of National Treasure are divided into Ceramic, Metalwork, Lacquerwork, Fabric-dyeing, Armor, Sword and others. There are not many works designated as National Treasure because they can be mass-produced and there are a lot of similar products. They are made in Japan as well as made in China and Korea. It is also called soilware. It is made with clay. The texture is simple and soft. If you tap it, it produces hollow note. The texture is hard like glassware. If you tap it, it produces metaric sound. Metalwork is a craft made with metal. Most of the National Treasure in this category is related to Buddhism. It is hanging bell used in Buddhism. When you strike with the wooden bar, it produces heavy and afterglow sound. It is purcussed 108 times in the night on New Year's Eve night. It is said to release people from 108 forms of evil. It is rung by the stick. It is used when the monks read sutra aloud, sing Buddhist song or perform the ascetic practices. Image of Buddha painted on the mirror. Sometimes marine animals etc, are expressed on the backside. It is a container to keep the Buddha's bone. Other examples are Phoenix of Byodoin (Upper right photo), water backet, lantern and so on. Lacquerware is a craft painted the lacquer from the sap of lacquer tree. 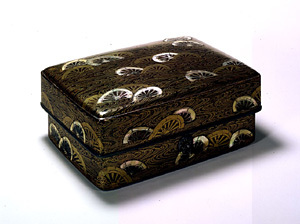 Lacquerware represents Japanese craft as it is also called 'Japan' in English. Lacquer is painted on wood, hemp cloth, ceramic, Japanese paper, etc. After painting lacquer, there are following method to decorate. After painting the pattern with lacquer, gold powder is poured on the pattern and fix. Shell of shellfish like great green turban is put to make a pattern. Engrave a pattern on the thickly painted lacquer. Engrave a pattern on the painted lacquer, paint the color lacquer, burnish, then paint the flat patter. Engrave a pattern on the surface of lacquered bowl and paste gold leaf or gold powder. The method to paste thinly cutted gold, silver or tin. The kinds lacquerware designated as National Treasure are the things related to Buddhism, portable shrine, harness, musical instrument, ornament and so on. Fabric-dyeing is a collective term to 'color' and 'weave' the cloth. There are both way. Coloring the cloth before weaving and after weaving. The examples of National Treasures are kesa (monks clothes), needlework painting of Buddhist picture. Kacchu is a Japanese traditional protective gear worn by samurai worrior in wartime. The characteristics of kacchu are colorful and methods from various fields are adopted, for example iron forging, leather, lacquerware, metalware, twining, etc. Swords have been produced from Kofun era (3-7th century), but when we call 'Japanese swords', it means the curved swords made after late Heian era (12th century). By the size, they are divided into Katana (Tachi, Uchigatana), Wakizashi and Tanto. In the broad sense, Nagamaki, Naginata, Turugi and Yari are included. The number of swords designated as National Treasure are the most among craft category. Some swords are designated only by the blade itself and some are designated mainly by the outside decoration. There are kinds of Kojinpo (Old Shrine Treasure) which you cannot put in one category. These are the clothes and furnishing goods including fabric-dyeing, lacquerware, sword etc, dedicated to the shrines.